This two-story Florida bungalow, circa 1915, needed a major remodeling, but required a design intervention sensitive to the period character of the house and the historic neighborhood. In order to increase roof ventilation and resolve some awkward geometry while retaining the hipped upper roof, a cupola and eave soffits were added. 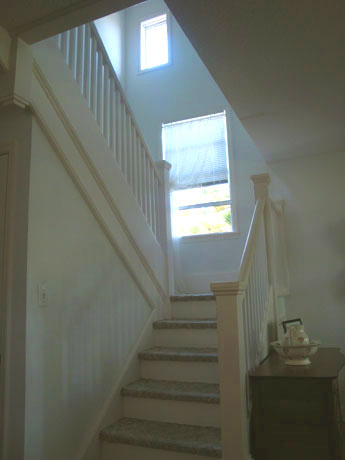 A small rectangular window was inserted in the center of each of the four second floor walls as a focal point, and a new paint color scheme was selected to enhance the existing trim. New trellised wood awnings provide additional solar protection and visual interest. Interior improvements include removal of several walls and addition of French pocket doors to open the interior to light; a completely redesigned kitchen; a redesigned south sun porch/family room; creation of a master suite from two second floor bedrooms; completely new electrical, plumbing, and interior wall/ceiling finishes. All remodeling changes were made within the existing house envelope.